Are you into looking for a new marketing gift but do not know what? Well, look no further because customized accessories is the new and upcoming trend. In conjunction with Happy Valley’s horse races, Sa Sa in Hong Kong is offering their horse shaped brooch, embellished with the imitation cat’s eye stone! Elegant customized accessories, like these, are perfect for ladies and for many occasions. 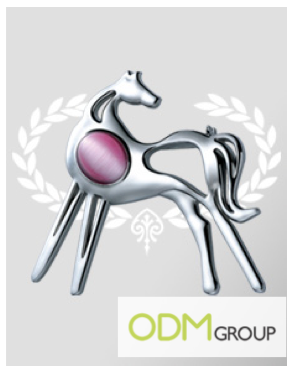 The horse symbolizes beauty, grace and nobility. Sa Sa definitely hopes to be associated with those attributes and collaboration with Happy Valley’s race courses help come up with these customized accessories. Customized accessories allow you to design your product from scratch. You are able to create your very own accessories for your clients. You can choose the shape, colors and materials you wished to be associated with and more importantly, you can customize your brand name on the accessories! This helps in the brand recollection. Also, if you provide a product that is practical and useful, your customers will enjoy it and this will increase in your brand loyalty. Customized accessories are not only limited to the ladies! You can branch out to the males by offering accessories like necklace pendant for males, cuff-links, tie clips or money clips. Customized accessories are extremely flexible to meet your needs and customer demographics. An elegant and user-friendly accessory would allow your customer to incorporate it into their daily lives. Thus, whenever they use your customized accessories, it will pique the interest of those around. There, others will be interested and would find out more about your brand! Hence, you are now able to market your brand to more than just your client base.